Gary, Howard and Mark otherwise known as superband Take That have had their likenesses turned into Lego. The mini me's were produced as ahead of their performances at the Manchester arena in May/June as well as the arena's 20th anniversary. 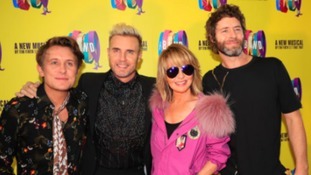 Take That, one the UK’s most successful live acts, are to broadcast their live shows into cinemas across the North West. Their show at London's O2 arena on the 19th June will be broadcast to over 20 territories and will have selected Encores worldwide. Anyone who has ever been to watch Manchester band Take That over the past 23 years will know that their shows are always a grand spectacle. And last night's first show of their 51 date tour didn't disappoint as it was filled with fireworks, flying and fire! After the departure of Robbie Williams, and more recently Jason Orange, the band have now kicked off their biggest arena tour to date as a trio and they're looking forward to coming home to Manchester. The boys have admitted it's hard work but just what can we expect from those Manchester Arena gigs in May? Take That star Howard Donald has secretly married his girlfriend. The Droylsden-born singer tied the knot with Katie Halil at an intimate ceremony with close friends and family last Friday. Then the following night on Saturday he threw a massive bash at a stately home. Former bandmate Jason Orange as well as his Take That pals Gary Barlow and Mark Owen were also in attendance. Gary Barlow has lined up his first solo tour for 13 years with a string of dates beginning next month, in Manchester. Take That star Gary Barlow is to be celebrated with an honorary award from the music business.